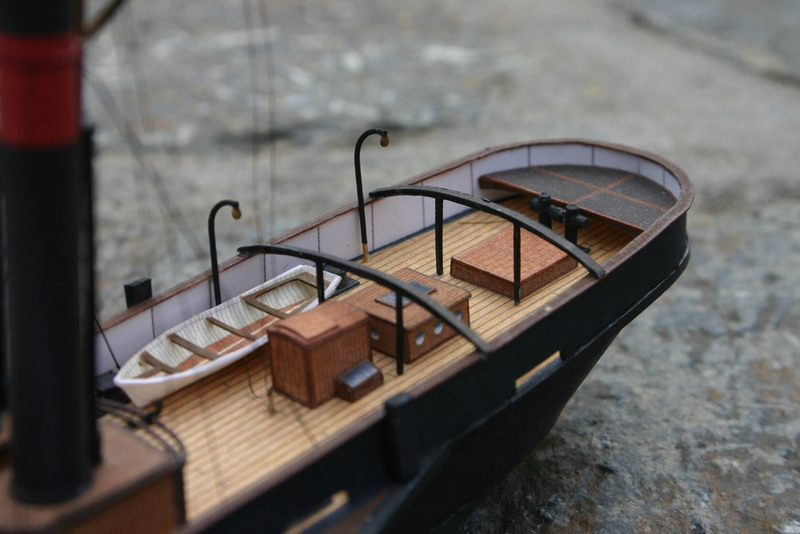 One of the earliest applications of steam power in Britain was the tug boat. Early tugs were capable of moving ships and barges on rivers and in coastal areas only, but as machinery became more powerful and reliable, the nature of the towing business changed. Long distance tows and salvage work were undertaken over ever increasing distances. In the late 1850’s, ‘Seeking’ became a highly profitable business. Here a tug skipper would prowl the waters of the English or Irish channels to head off homecoming ships and offer his services for the tow into port. The ships were eager to get their cargoes to market quickly and paid top rates for a speedy tow. Many towing companies jumped into the trade, and soon Seeking evolved into a highly competitive, if not downright cut-throat, business. One of the most successful players in this field was the firm of William Watkins, Ltd., specialists in long-distance towing. The Watkins tugs Victor and Britannia were the most powerful of their time. 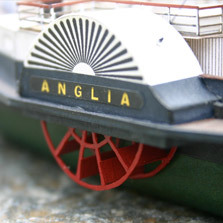 However, both were eclipsed in 1866 by the new iron side-wheeler Anglia. 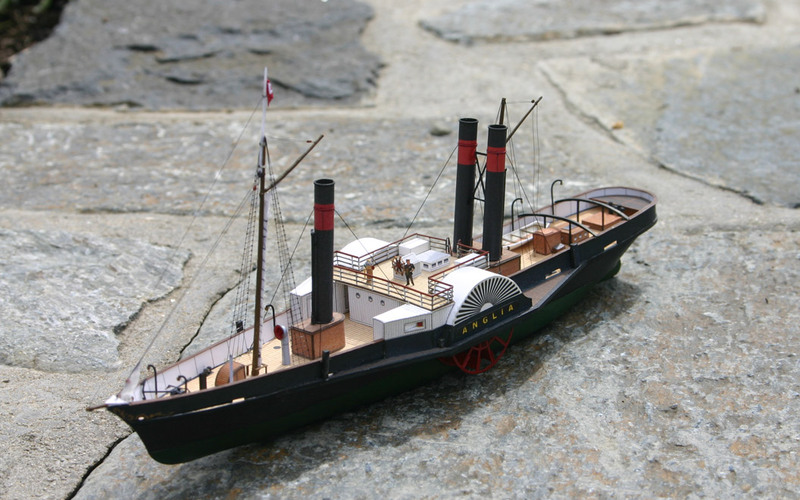 She was the largest, most powerful tug in English waters and soon distinguished herself in a number of high-profile jobs and spectacular long distance tows: In 1866 she attended the trials of the cigar-shaped yacht Ross Winans (also available as 1/250 scale model kit from Walden Models). In 1873, she carried the Shah of Persia and his entourage during the Spithead Naval Review. In 1875 she brought the disabled Allen liner Syria a distance of 4,315 miles from St. Helena to Southampton in just 51 days. In continuation she towed a dredger from Cardiff to St. Petersburg. In 1878 she famously brought the obelisk barge Cleopatra from El Ferrol to London. (Cleopatra is also available from Walden Models) While this was not her most difficult tow by any means, it certainly became her most memorable. The story exceeds the scope of this brief account and has been told elsewhere. 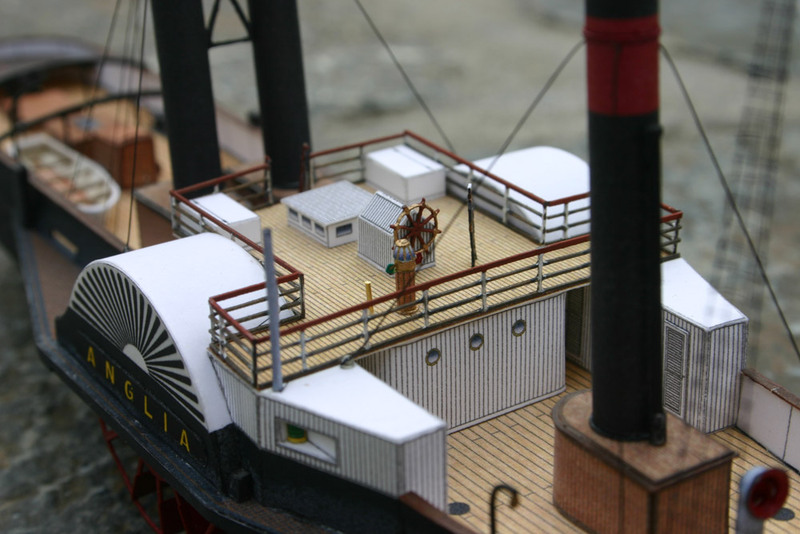 Anglia featured unusual machinery for her time: three tubular boilers instead of the customary one or two furnished steam for her powerful side-lever engine, which developed 700 ihp. The curious arrangement of her funnels – two in line abreast abaft the pilot house, and one before it, earned her the nickname “Three-fingered Jack”. 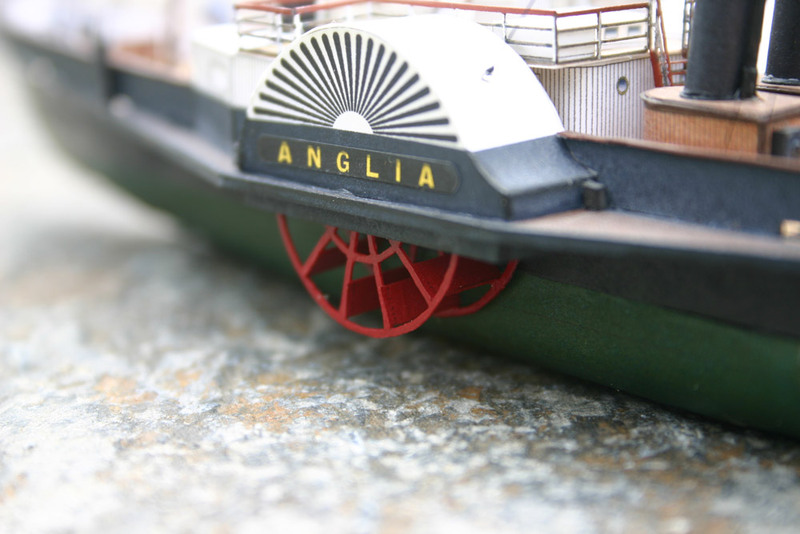 Her bunkers were the largest ever put into a tug and held 90 tons of coal – a necessity, as Anglia’s boilers devoured prodigious amounts of fuel. Reportedly she burned 30 tons on a single trip from Gravesend to Beachy Head, a distance of only 150 miles. Despite this flaw, the Anglia’s design was highly successful. 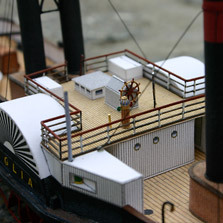 She was awarded first prize for tug design at the Naval Architect’s Exhibition a full ten years after she was launched. In 1880, new boilers and shafts were installed at Somes Drydock. 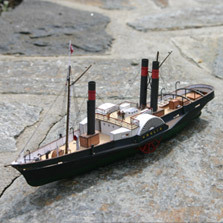 Anglia remained with the Watkins fleet until 1894, when she was sold. Her new owners moved her to the northeast of England where she was eventually converted into a coal barge. At the outbreak of World War One, Anglia was requisitioned by the government. 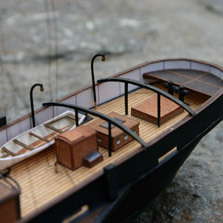 Throughout the war she hauled coal and munitions across the channel to France. Here the trail goes cold. Presumably the once-proud tug was broken up shortly after the war ended.